FREE SHIPPING on your whole order when you buy one or more! 62 high quality Magformers® pieces – 30 squares, 20 triangles and 12 pentagons. Explore and experiment with these shapes in six bright colours to create simple and complex 3D models. 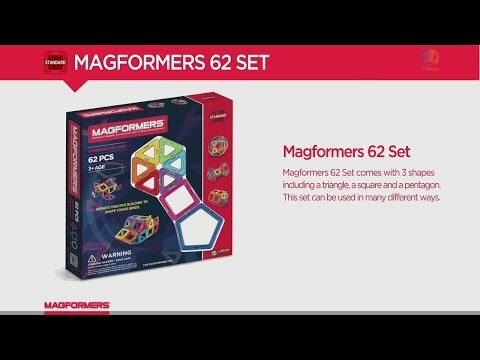 This is a value set of 62 Magformers® pieces. It includes 30 squares, 20 triangles and 12 pentagons. Explore and experiment with these shapes in six bright colours to create simple and complex three dimensional models. Feel the magnetic force and have countless hours of fun exploring the Magformers® connection possibilities. Watch the videos above to see just a few of the amazing designs that can be made with this set. All Magformers® sets are compatible with each other. This is an excellent starter set or for adding to an existing collection. Magformers® are the original and best magnetic construction set. Magformers® use cylindrical rare earth (neodymium) magnets. Because of the unique cylindrical shape of the magnets, no matter how they’re connected they always attract. Combine this with their strength and it means shapes can be laid flat on a table and pulled up to form different builds. Magformers® are the intelligent construction set for building minds that understand geometry, spatial relationships, mathematics, magnetism and more. Magformers® are made to the highest quality. Every Magformers® geometric magnetic shape is sonic welded and is BPA-free. Magformers Wheels – turn your creations into cars, trucks or trains that really roll!